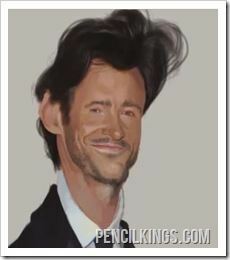 Get caricature painting tips from the pros! 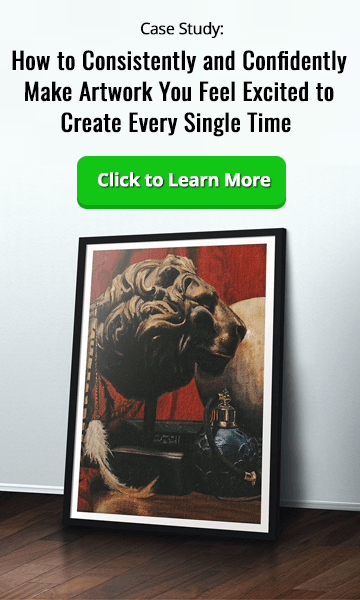 In this caricature painting lesson, we’ll continue to work with tonal values to really flesh out those features on our caricature painting, focusing specifically on the mouth area and showing you how you can make this look as realistic as possible. Firstly though, we just need to add some finishing touches to the nose by adding darker, gray-blue lines to give added definition. Refer to the original photo to give you an idea of where the shadows fall. 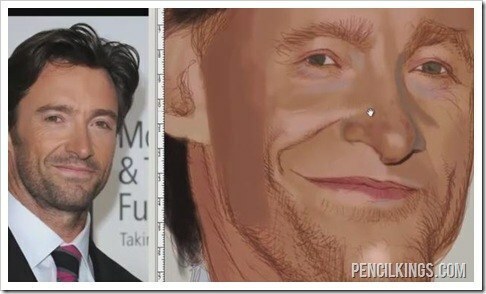 In this caricature painting tutorial, you’ll have noticed how Giovani continually zooms in and out while he’s working. 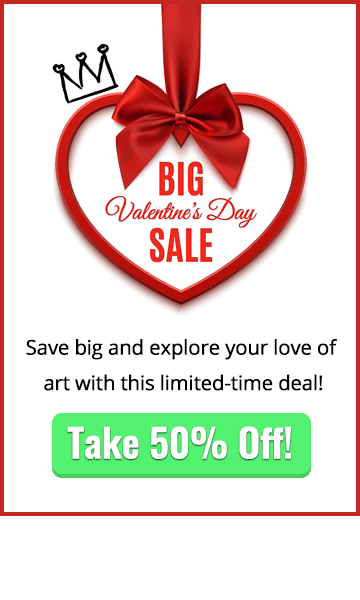 This is a really good technique to adopt in your work, as it will enable you to block in large areas of color, work closely on small details such as the eyes and enable you to get a good all-round sense of how your painting will appear without getting too absorbed in one area. It’s also good to flip your canvas from time to time, as this will help highlight any areas you may have missed while concentrating on other parts. Note how Giovani continues to rework areas and add more different tonal values to give a real sense of form. Some of these details may not be visible when you zoom out, but they all play a valuable role in creating a convincing painting as a whole. Now, add some more shading to the left-hand side of the face using broad strokes of color. 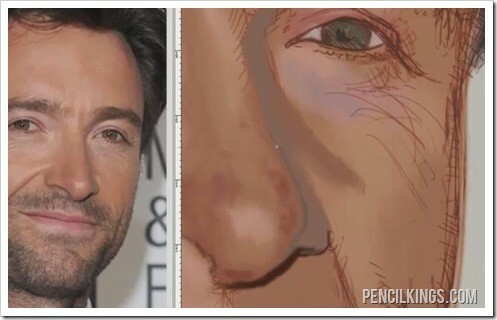 This may look a little flat at the moment, but once you’ve added some more blends to your caricature painting, and painted Hugh Jackman’s trademark stubble back in, everything will soon come together in spectacular fashion. After this, take some time to tweak areas such as the nose, adding more details and continuing to blend your colors to create just the right effect. The more you develop as an artist, the more familiar you’ll become with the features of the human face, such as underlying bone structure and where areas of shadow naturally occur. It’s a process that will soon become almost automatic, so you won’t have to spend quite as much time deciding where to make your next brush stroke. Try to think about how different areas of the face influence each other and how the oiliness in the skin in certain areas such as the nose can result in more pronounced highlights in your caricature painting. This will help inform any paintings you make in the future. Creating art is the end result of hours of repetition and study so that you can make informed decisions based on what you already know and what you see before your eyes. 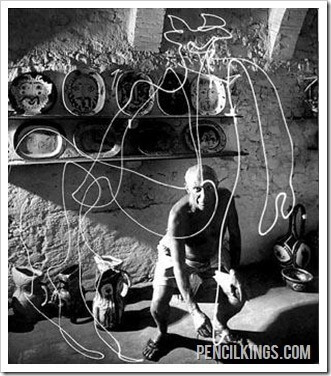 Look at this photo of the famous Spanish artist, Pablo Picasso, to give you an idea of how years of observation meant he could sketch out the shape of a bull using a torch in the split second it takes to shoot a photograph. Next, it’s time to move on to the mouth, where we’ll be following Giovani’s example and spending a considerable amount of time on this area to create the right look in your caricature painting. When painting the mouth, notice how the brush strokes follow the shape of the lips exactly – some are diagonal, while others are horizontal and so on. 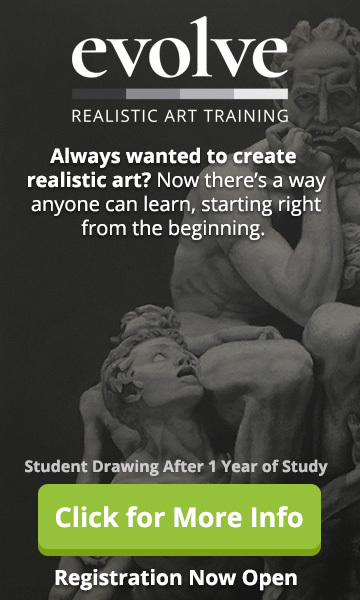 This technique will help you create a lifelike painting that actually looks 3D. 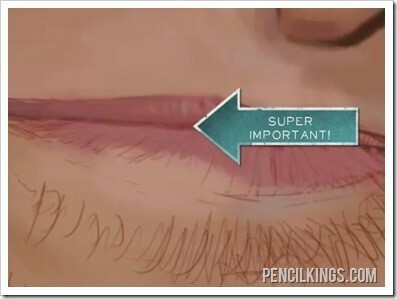 A very important point to remember is not to lose sight of where the line is between the upper and lower lip. Everyone’s lips are unique, so getting this line right can make all the difference between achieving a credible likeness of your subject or not. Also bear in mind that this line should never be true black, but will reflect the colors of the lips and light source surrounding it.